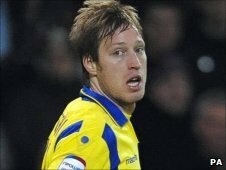 Leeds' Argentine striker Luciano Becchio has signed a new three-and-a-half year deal with the club. The 26-year-old, who is Leeds' top-scorer this season with 12 goals, joined the club in the summer of 2008 for an undisclosed fee from Merida. He has scored 47 goals in 126 appearances for the Yorkshire club. "I'm very happy to sign," he told the club's official website. "I love the fans, we are doing well and we want to get to the Premier League." Boss Simon Grayson added: "He has shown his importance to the club with his goalscoring ability. It was vital that we secured his services after losing Jermaine Beckford last season. "It is a major boost to everyone as there was considerable interest in him." The news caps a superb day for Leeds, who earlier beat Championship leaders QPR 2-0 at Elland Road courtesy of a Max Gradel brace to move up to second in the table and extend their unbeaten run to nine matches. On the win over Rangers, Grayson said: "Given the quality of the opposition and what QPR have achieved, this was our most outstanding home performance of the season. "We have a high expectancy level at this club and rightly so. Our fans want and expect the best. "The club deserves to be back in the Premiership but there is a lot of work still to be done if we are to achieve that. It is where we finish in May that matters, but I was delighted with the performance and the manner of the win. QPR manager Neil Warnock lamented his side's defending, saying: "It was a good game, but if we defend like we did we will get beaten by any team in the division. It is disappointing because that part of our game has definitely been our strength this season." Having gone unbeaten in the league for 19 games, the defeat was Rangers' second in two games and their lead at the top of the table is now three points - although they do have a game in hand on a number of the chasing pack. "We have played nine of the top 10 sides in the division away from home so we just have to keep going and stop feeling sorry for ourselves after two defeats in a row. "If you had told me we would be top at Christmas after losing only two games I would have snapped your hand off. "I thought the (Leeds) celebrations in the tunnel were premature because we are not at Christmas yet. You would think they were already there, but I think anybody could go up. Leicester and Portsmouth are two decent sides, for example. "I quite enjoyed the game because there was a great atmosphere generated by the crowd but we conceded two very poor goals. We probably caught Leeds at the wrong time because they are on a long unbeaten run."